Hey all :) I often go for the same colors when stamping, but I want to try out more different combinations as well. So today I went for pink with purple! 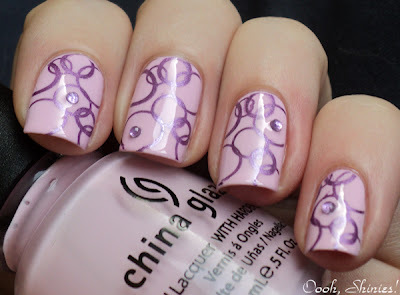 I stamped with China Glaze Harmony and Konad plate m85. Some circles weren't complete at the tips, because my nails are slightly longer than the images right now. Time to file 'em down! I haven't used rhinestones in ages, so I added a few of those as well as the finishing touch. Orange stripes, Dew and some changes!